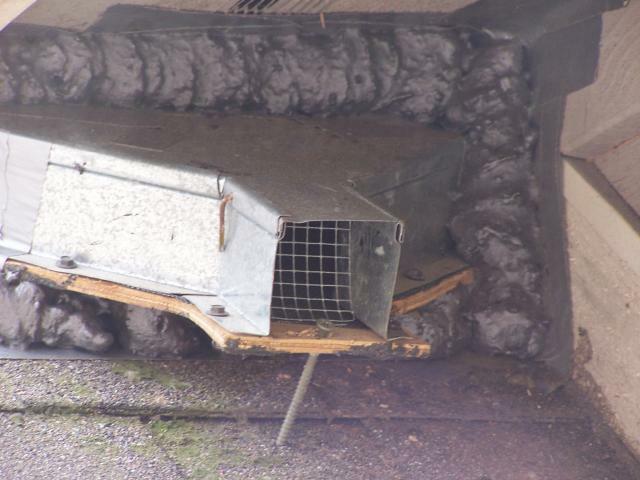 if bats are only getting in and out via ridge vent, where would you put the excluder? 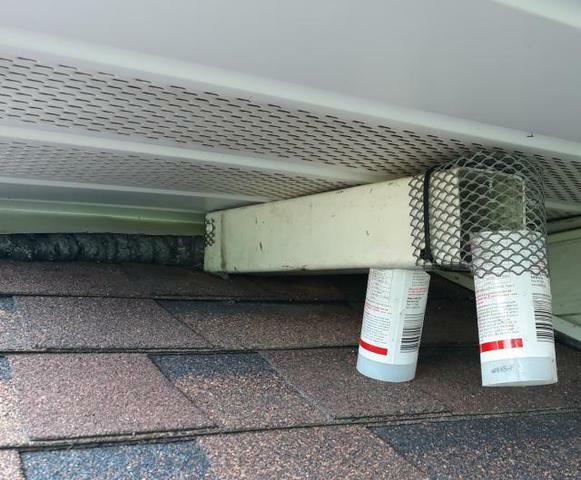 My thought was to ridge guard or hardware cloth the entire length of the ridge vent except the end, and then put the excluder at the very end of the vent, but my concern is that they won't find it. I might not be doing the best job at describing, but maybe you get the picture. Last edited by BeaverDam; 08/31/18 06:17 AM. Don't ever make bats go where they are unfamiliar in exiting. It can cause back ups and confusion for them which only leads to issues. Do a watch to help to determine to the best of your ability where they are exiting and prepare a device large enough to allow them to crawl out and fly off as they have been accustomed to doing. Seal off and tighten up the remainder of the ridge vent prior to venting the bats. And of course you need to seal the remainder of the home. 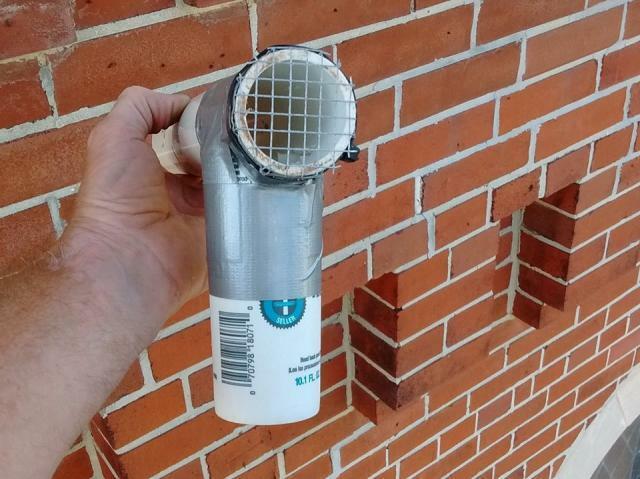 Here is a method I devised several years back that we have used many times on commercial schools and residential homes for bats using ridge vents as a means of structural entry. These devices have worked well for us and I still keep them on hand as a result. Some of the devices were rather large but light weight. The size was needed to cover the wide area that the bats were using to exit. I basically created a large funnel that was taped and attached to the ridge cap at the exiting position. In this case it was on a cap tile ridge on this particular roof with a slate roof construction. 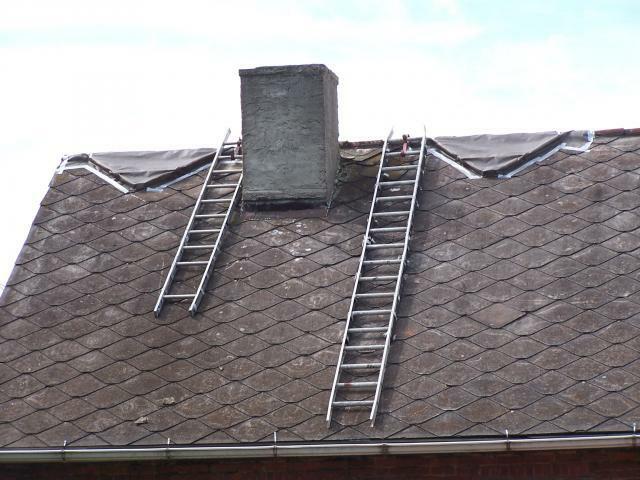 They can be used on asphalt shingles or tin roofs also. I framed the large eviction devices from lathe wood 1" x 3" to make them rigid but light. I then stapled some weed block material to the wood frame to the size and shape that I desired. I left a cloth apron on the back side of the device to allow enough material to fasten it to the roof to prevent any entry under the weed block material in the rear. 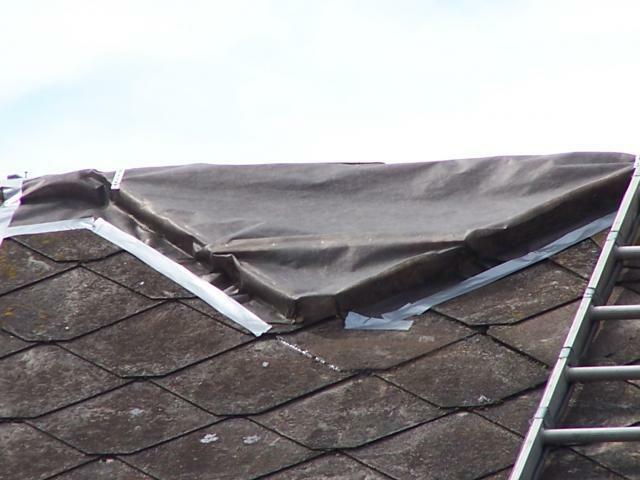 Duck tape with some Hercules putty worked very well on a clean roof. The devices held fast long enough to get a good eviction. We then slowly sealed the cap tiles individually. It was slow going sealing individual tiles due to the overlap design. Very tedious work but it can be done. In the front funnel part is the eviction/exit point which is the narrow end on the down side of the device. I left about 3/8" gap at the bottom of the exit point in the weed block material. It was about 2" across at that point.I worked extremely well. Here are some photos I found in my library of this job. Some bat jobs can present challenges due to the construction design of the building. Many times forcing you to make adaptable devices that fit the situation the best to allow a fast and unobstructed exit of the colony. This job had a large colony that chose for their reasons to use several exit points in the ridge which forced me to make multiple devices to make the exiting system work the best without making the bats look for other exit points. It is never a good idea to force any animal or bats to search for other exit points then those that they are already familiar with and have been using regularly. That way of thinking leads to problems for the consumer and potential back ups. Ultimately a big head ache for you in many cases. Another device I make and have used for many years in dormer type areas. You simply use ridge guard and install a bat cone. Keep in mind, the whole house must be sealed up tight, or they will move to another location. There was no ridge guard around in these days and the exiting points were many and wide apart for single bat cones and too small. 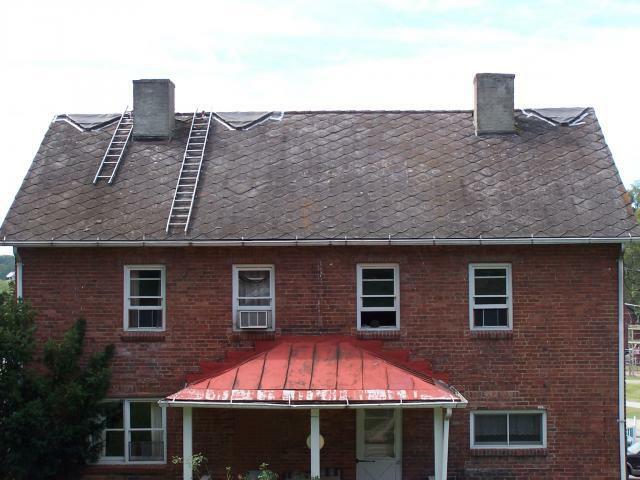 We had to do other methods when there are no asphalt shingles. Terra Cotta and old slate construction is a different animal then traditional shingle work. Shingle work is easy. Bob hit the nail on the head. Don't try to force bats to a specific location like you can do with other animals. They don't like it! The simplest method if you cannot find the preferred points from an inspection is to do a bat watch. This way, you can see what areas of the ridge can be addressed and which need to be left alone. Once you know the where, the how becomes much simpler. 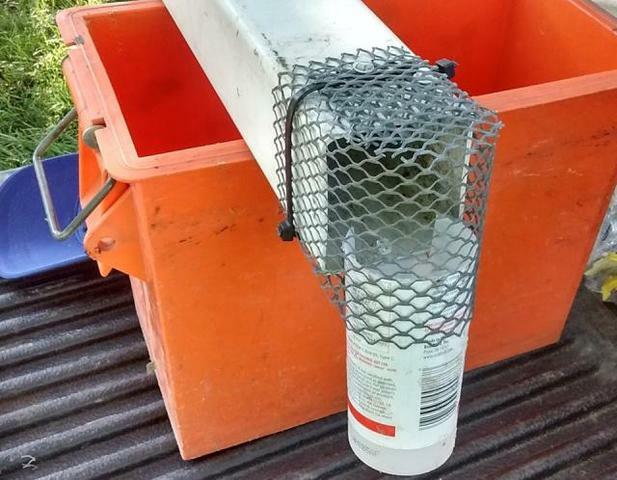 You can use bat netting or other materials, or build a device like Bob did. The key is to make sure that you have coverage for on the sides of the opening as well as a good bit down from it. Personally, I use the bat netting from WCS in these cases. I cut the width and length I need then attach it to asphalt and shake shingles with 3/8" staples from a hammer staple. 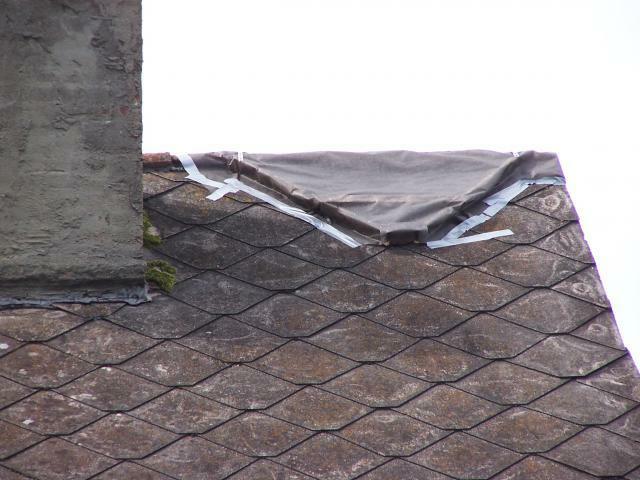 For metal, slate, and asbestos shingles (like the one's in Bob's photos), I use Velcro strips. Again, the key to using netting is to make sure that you extend far enough on either side of the opening as well as below it so that the bats cannot get under it. Thanks Bob and WCT, that will help immensely for future reference. Luckily with this job, I just finished the inspection and it was relatively easy figuring it out. The entry points were two dormer locations and there was absolutely no ridge vent. It was a new structure and the other areas that needed sealing were minimal. 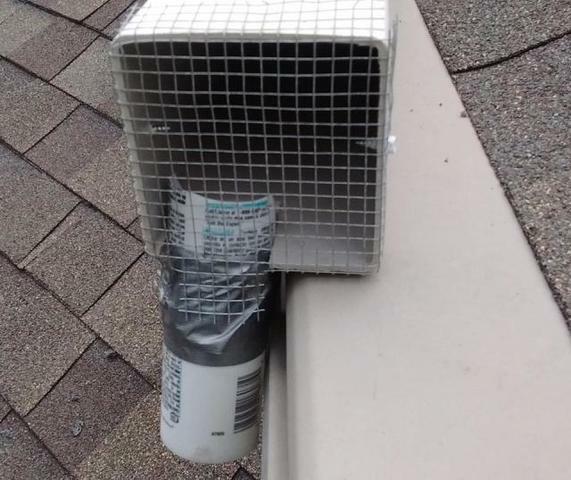 DaveK, I think you're missing the point of what I'm trying to get at, what said was exactly what I was going to do, the problem is, its not always easy to figure out where to install the bat cone on the ridge vent, even after doing a bat watch in some instances. Bob, I really like your dormer excluders. For me, I have always used a bat cone in that instance and it has worked for me pretty well but I like your idea better. It funnels the bat down and out better and makes it so that the bat can come out the same exact spot it had been coming out of. Do you permanently leave those installed then? It looks like it would be a bit of a mess to clean up if you didnt? You wouldn't happen to sell those would you? Last edited by BeaverDam; 09/01/18 03:19 AM. Looks like the reason for the tape is so its easy to remove clean up and install cool stock. Not a response to the ridge vent issue, but for those roofline transitions, dormer corners and soffit returns, I've found that extending the drop-out tubes a bit works great. I use these on the more gradual roof grades where there isn't much slant when using a straight tube. Allows the bats to crawl out horizontally with no restriction. The screened end draws them to the drop-out tube (air flow). I'll include a few pics. No limit to what a person can use for bat work. 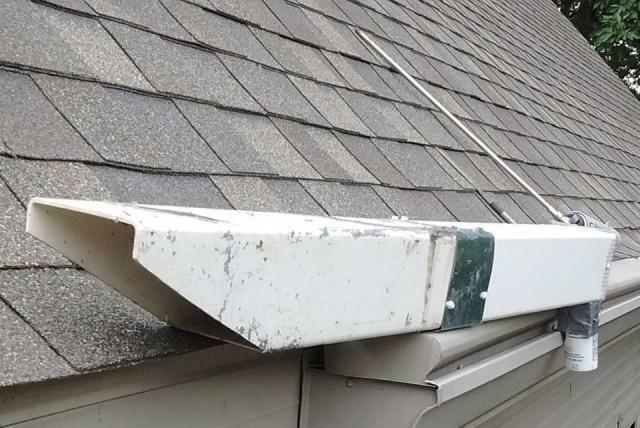 Extension is a piece of old plastic gutter downspout. Do not construct with any screws protruding into the channel, as their wing membranes will get hooked on them. Never have any tubes sticking up into the exit area. Bats will NOT climb up to get into an escape tube. 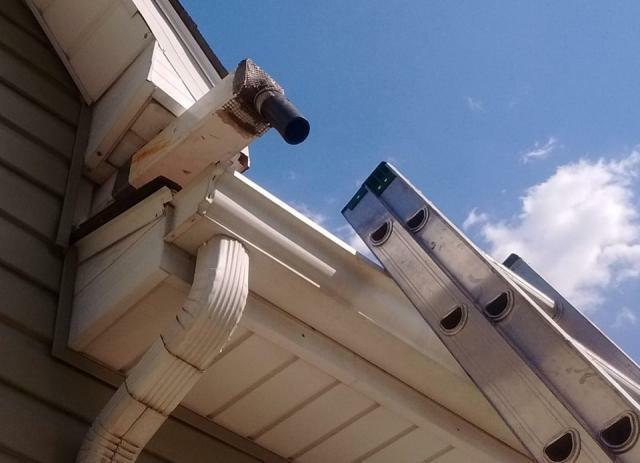 I've seen guys drill into soffits and shove a PVC tube 2 inches into the hole. They will not exit if they have to climb up to get into the tube. I cut the tube so they simply crawl right over the edge. 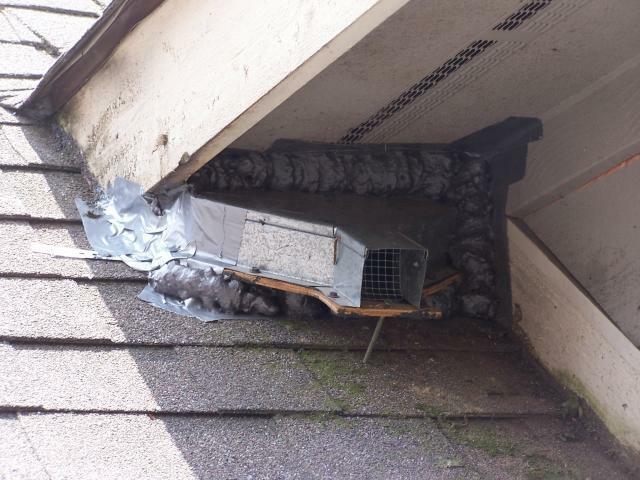 This home had a very gradual roof pitch, and the bat access hole was WAY back in a roofline corner. This is the longest extension excluder I've ever had to use. Make sure the attachment area is well sealed so they can't find their way back around it. Black foam is good for temporarily sealing the excluder devices, but make sure you don't use too much, as it can close off the exit hole into the tube if you go crazy with it. Screening the far ends will help the bats navigate to the drop-out tube due to air flow. Note back side of drop-out tube is notched (cut away) to allow them to drop out with no climbing. 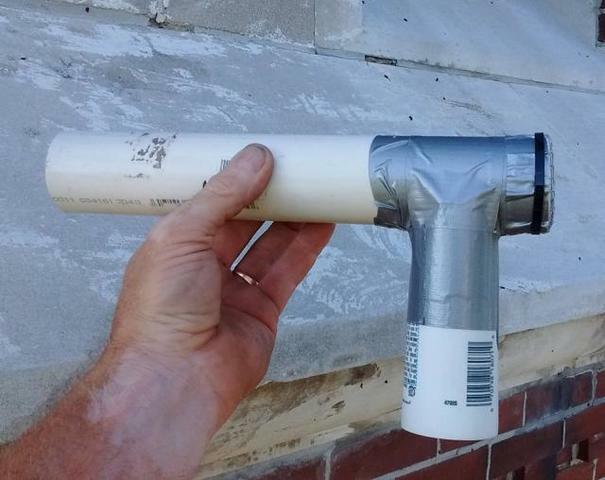 Smaller version using PVC pipe. Screened end allows air flow. Extending the exit point allows clearance for drop-out tube. Foam for excluder mounting is ugly, but effective. 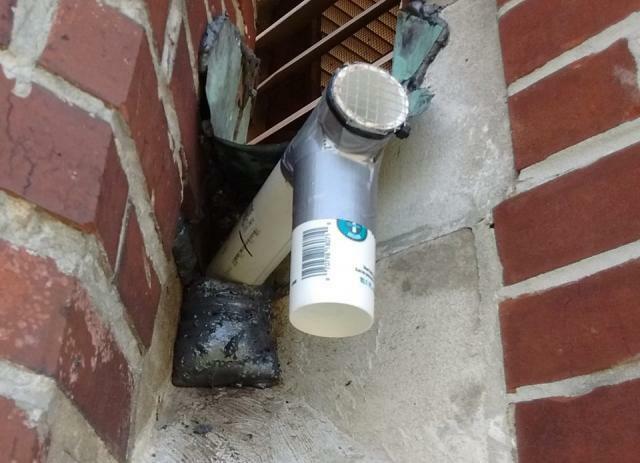 It's on a church bell tower, so no one will see it to complain! Plus it comes down in a week or two anyway. Weird roofline intersection, required getting the bats past the gutter. Sometimes I'll just use electrical conduit elbows. Whatever works. Sorry Beaverdam.....for not answering question. You need to look closely and find the location they are using. You just get an eye for it when you do thousands of homes. I tape over all the area that touches the house, roof and the device. I then foam the area over the tape to secure the device and to seal any possible re entry points around the device. The device install area cleans up nicely in the way I have learned to install these devices in this setting. No mess or staining. I usually use a bent piece of coil stock to seal the opening with some silicone as adhesive. A very aesthetic finish when completed and a permanent fix to the problem. We use various devices to fit each setting as Ron has stated. The longer you do this work you can improvise devices quickly once you understand a bats behavior as to what they will and will not accept therefore learning to make exiting as easy as is possible for them. Providing good air flow and drafting to a bat is key to any good device install. It only reinforces their instincts as to the direction of the exit point. Give them an easy reasonable path and they will generally follow your lead.